Boutique wineries in Israel date back several decades and have been joined over the last 10 or so years by craft distilleries producing high-quality gins, araks and whiskeys. This drive to liberate the libation landscape of Israel has likewise extended to beer, at first fueled by small-batch microbreweries scattered around the country. A trend among the craft-liquor pioneers is that many are immigrants to Israel of Anglo or French origin simply looking for a taste of home. Beer Bazaar, an Israeli craft beer empire that got its start as a small pop-up in Tel Aviv’s Shuk HaCarmel in 2013, was founded by Avi Moskowitz, who hails from Brooklyn. 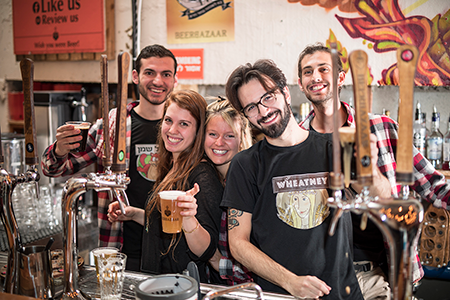 With a mission to spur Israelis’ interest in top-quality brews, Moskowitz has since expanded Beer Bazaar to include four other Tel Aviv locations as well as one in Jerusalem, which has become the highlight of Machaneh Yehudah’s flourishing night-life scene. What Moskowitz has done, he tells me, is scout the best beers made in Israel and gather them in one place. 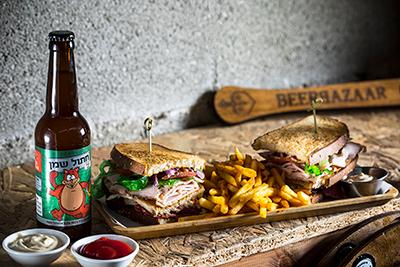 Post Passover, the Jerusalem market location is busier than ever, hosting live performances and dolling out some of the city’s only pastrami sandwiches on rye, which are chased down with one of the establishment’s seven house-brewed beers or the 100 varieties of Israeli beers lining the shelves. Two popular favorites are HaDictator and HaDubim. Before New York-Born oleh David Cohen opened Dancing Camel, Israel’s first microbrewery, in 2005 in Tel Aviv, the only beers produced in the Jewish state were mass market labels like Goldstar and Maccabi. Today, craft beer is a small but growing industry, as 30 brewers working out of 10 microbreweries are adding an Israeli flair to European- and American-style brews. Through the Hebrew-language Facebook group Home Brewers of Israel and the English-language groups Israeli Beer Rocks, craft producers share ideas with those most enthusiastic about the beer scene. Beer Bazaar even hosted a contest where the best home-brewed beer was produced in the the company’s Kiryat Gat brewery as a limited-edition beer.